This episode we review Bird Box, which is available to stream only on Netflix. It’s probably one of the best horror movies of 2018. Even though it was released the Friday before Christmas, it has already been watched over 45 million times according to Netflix. 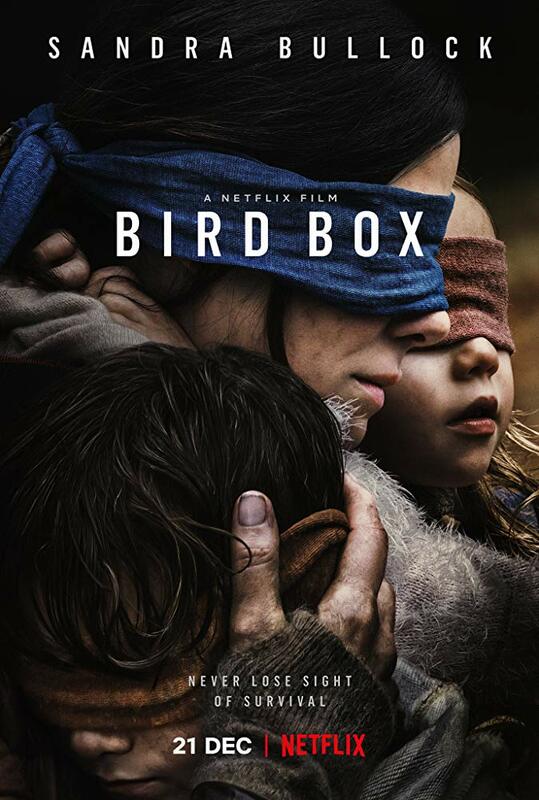 Bird Box tells the story of Mallorie (played by Sandra Bullock) as she experiences the fallout of a worldwide invasion of monsters that cause people to commit suicide if you look at them. The survivors of the invasion figure out that they must block their view with blindfolds or window coverings to resist the influence of the unseen creatures.The non-linear narrative jumps between the onset of the global disaster where Mallorie finds herself holed up with a motley crew of survivors, and five years after the fact when Mallorie is floating down a river with two small children trying to get to safety. Will they make it? Is it a happy ending? …You’ll just have to …SEE it. There is a star studded cast that give great performances. Notably Sarah Paulson in her small role as Mallorie’s Sister, and Trevante Rhodes (Moonlight), the love interest. John Malkovich is also in it. It’s directed by Susanne Bier which has mostly just directed dramas and romances, but she has shown her skill with this movie. This is a really high quality movie that I’m kind of shocked wasn’t released in theaters. It would have done great, as evidenced by it’s record breaking first week on Netflix. It’s very tonally similar to A Quiet Place, and that’s only helps it. There is a lot of creative problem solving on display in this movie, but most notably, this movie is a great example of how to not show the monster. Another great compliment I can pay to this movie is that all of the characters’ actions made sense. Any time that I was yelling at the screen, it was from dramatic irony, not because of a stupid character decision. The writing was very good at building the world and communicating the situation in a very short period of time. Lots or really tense moments and great payoffs throughout. 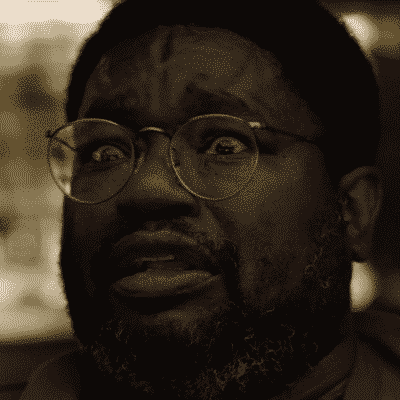 First, let me say, that this movie has some of the best scared faces of the year. 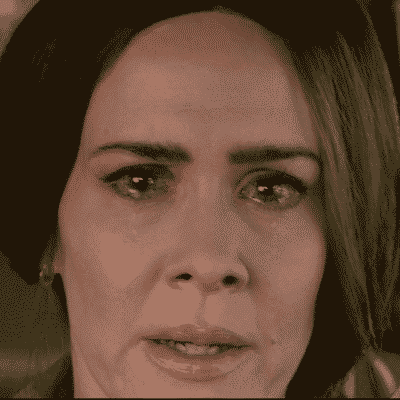 If there was an Oscar for best scared face, I think Sarah Paulson and Lil Rey Howery would get nominated. Alright, lets get to the rest of the movie. There are some great moments of tension in this movie that don’t rely on characters making stupid decisions. This is difficult for some horror movies for some reason. Two moments in particular are very effective and had me clutching the air. First, the scene where it is revealed that Gary, played by Tom Hollander, is an acolyte for the monster. Some people may think it’s cheap that this reveal happens as the births were happening, but to me, it just made it more effective. It served as a prime moment of distraction for Gary to make his move. The next part that I was clawing at the armrests was towards the end of the movie when Mallorie is separated from the children, and the monster is trying to trick the children to take off their masks in the voice of Mallorie. It was the penultimate scene of the movie and was so effective because at this point, you understand that the detachment that Bullock’s character is displaying towards the children throughout the movie is just a facade. She cares deeply and has masked her attachment to protect the children in case something happens to her. During the scene where they are separated, it is nerve-wracking because all of her effort could be for naught. Well, if you’re reading this spoiler section, you might want to know what happens in the end. Like my wife, who is a horror lightweight asked me: “is it a happy, or a sad ending?”. Well, it’s a happy ending. It might seem like an obvious choice, but throughout the movie, it truly felt like it could go either way. They killed Sarah Paulson’s character within the first 15 minutes, so they weren’t going to shy away from a super depressing ending if they wanted to. To say that it is a happy ending, isn’t to say that it is cheap. The ending most of all just feels satisfying. It has a slight reveal that makes sense, but mostly it is satisfyingly because it ties up the thematic material so well. Mainly surviving vs living, and human connection. If you liked A Quiet Place, then you should like this movie. It’s not as derivative of it as you might think, it is just very tonally similar. The acting is excellent throughout, as well as the direction. The story and thematic material are handled adeptly while maintaining a steady pace of tension and release. You should definitely see it. It was definitely one of the best that we’ve reviewed. It turns out it’s more controversial than we thought. We have had a lot of discussion on social media with some people that really disliked the movie. We talk about it a little bit on our next episode where we review Escape Room. Stay tuned for it’s release on Wednesday. Thanks for listening Terran, be sure to share the pod with your friends.